These colourful events, that had never quite vanished with the Roman Empire, suddenly sprang to fresh life in the mid sixteenth century, in the form of a new street theatre known as Commedia dell'Arte. Players - mountebanks, mimes, musicians, actors, bravos (spadaccini) and jugglers and street singers - began to gather into small touring troupes, and play, at first, to the populace, on makeshift stages that they would themselves put up on a village square, on market day or on a feast day. This genre, through rooted in the theatre of ancient Rome, actually derives both from the Greeks, and from traditional Etruscan festivals, for in both the latter recur certain basic elements that were to become peculiar to the Commedia dell'Arte. The Etruscans held a rustic festival (i fescennini, ancient Italic songs typical of the city of Fescennio), based on the coarse pranks the gleaners and harvesters would play on one another. The Festival's traits are very like what later became the Atellane: crude farces and political satire, improvised on a sketchy scenario, and often recited by one actor, whilst another would illustrate the events in mime. From the Atellane, the Commedia dell'Arte took a penchant for the ad lib jest, leavened with obscenity, amusing the public through improvisation. 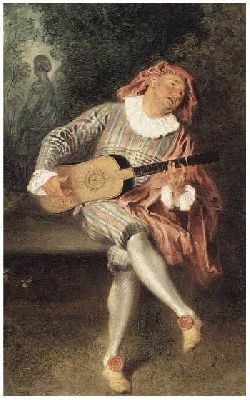 As with the Masks of the Commedia dell'Arte, the Atellan farce never portrayed true individuals, but rather stock characers, each wearing a typical Mask and costume: Pappus, the senile old codger, forerunner to Pantalone in his lascivity (Duchartre); Maccus, the hang-dog souffre-douleur; Dossenus, the wiley, intrigant hunchback; Bucco, the rude blunderer. 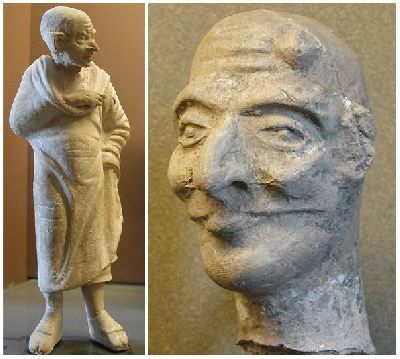 The haggard countenance, the arrant cowardice later reappear in Pulcinella, whose vestment is white, like that of Maccus the mimus albus, and who has the same great hooked beak seen on the ancient statuette believed to represent Maccus (Duchartre). Besides the stock characters of the Atellan farce were monstrous beings: Lamia, the gossipy intrigant, Manducus, the glutton, who is related, in part, both to Plautus' Miles Gloriosus (boastful soldier) and to the Capitan in the Commedia dell'Arte (Duchartre). 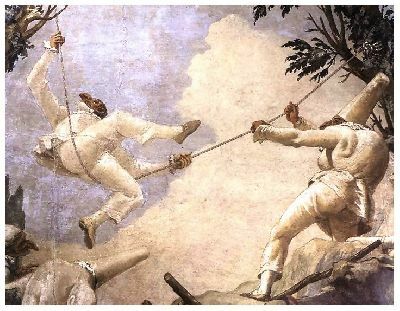 Like other Atellan stock characters, both Pantalone and Scaramuccia occasionally wear a phallus, while Arlecchino and Pulcinella defend themelves with a bludgeon. 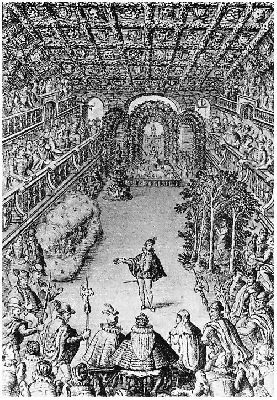 Another forerunner to the Italian comic theatre of the Sixteenth Century was the teatro fliacico (fliacico, "pertaining to the Fliaci, i.e. 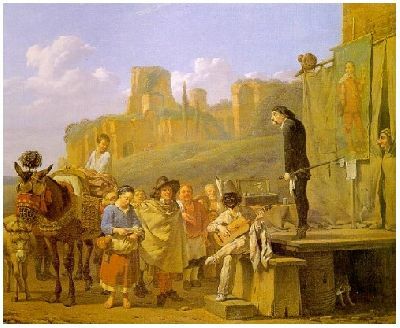 vagabond players): this was the word used in old Magna Grecia for scènes de genre, played by travelling mountebanks like the first Comici dell'Arte. The teatro fliacico too was based on a dispute between stock characters - the miserly old man, the cunning servant, the idle lout, the ne'er-do-well. By the First Century BC, in the day of Caesar and Cicero, the setting had become Rome, and the plays were known by the generic title of Togata (the pallium being the Greek cloak, and the toga, the Roman). Both the Palliata and the Togata left great latitude to mime sequences, that consolidated Roman pantomime, itself a source of inspiration for the Commedia dell'Arte. For the intrigue to be played out in mime, as another player would recite, sing or chant alongside, was essential for a performance to be understood throughout the polyglot Roman Empire. When the Comici dell'Arte moved to Paris, or indeed, anywhere abroad, they found themselves faced with the same stricture. One should also point to the very popular mime performances, feeding a taste for performances that included wrestling scenes. The characters in the Palliata of Plautus, a playwright active in the first half of the Second Century BC, are closely related to the Commedia dell'Arte. These are not individuals, but types, Masks, that everyone recognises the moment they appear. The moving force in Plautus' comedy is an Arlecchino or Zanni ante litteram, the servus, the ironical, cunning, over-bold servant who thinks nothing of defying his aged master's fury; he sets up complex machinations against the old man (senex), to help the adulescens, the master's son who moons about in a love-trance. On occasion, the senex is punished for being a miser (cf. also Aulularia and Asinaria, where the senex role is replaced by that of the wealthy and avaricious matron), or where the senex is punished for daring to contend with the adulescens for a young woman's love (Mercator). These dramaturgical incidents were later exploited by the Commedia dell'Arte. 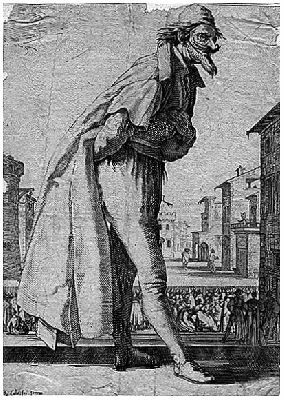 The stock character of the servus, the senex and the adulescens reappear in Italian street theatre during the Renascence, with characters like Pantalone and the love-struck youth. The same occurs with the parasitus and the Miles Gloriosus, the boastful mercenary who later becomes the Captain, or Capitan Fracassa. The Commedia is notable also, for social polemics, for example, where the "proletarian" Masks triumph over the higher castes. This too is a dramaturgy codified in Plautus' day, subverting convention by painting an upside-down world, where the servant bests the master, and youth bests age. Other situations dear to the Commedia of Plautine origin, are those of "deceptive resemblance" and the Changeling (Amphitruo-Anfitrione, Mennaechmi-I Gemelli). Another influence on Italian theatre of the 16th Century, was satire inspired by the sophists, that had led to a literary genre typified by Petronius' Satyricon. Arlecchino's monologues are heir to the spirit and orator's acquaintance with the Absurd found in the Dialogues of Lucian of Samosata (Second Century AD): both these, and Arlecchino's dazzling tirades are often based on surrealistic tales, paradoxical eulogies or biting satire. Lucian's dialogues, mimed playets (scenette di mimo), shot through with humour, appear to have been written for a Mask of the Commedia dell'Arte. For example, to restore the Fly's Lustre, praising that annoying insect in the most ludicrous terms, or telling the "true tale" of the Fly's voyage to the Moon. It may be Arlecchino the iconoclast, and not Lucian, who flogs at auction the lives of the great philosophers, or mocks the Gods, excoriating their flaws and foibles, as he spins out empty rhetoric, and perorates in defence of the consonant S (Sigma), that had filed suit against the T (Tau) for prevaricating in Attic dialect. Lucian - another parallel with the Commedia dell'Arte that was to be - was himself wont to vagabond, stopping here and there to utter some provocatory declamation, or to ad lib a reading. His dialogues are important, as they are, in essence, a tribute to pantomime. As we have just seen, the Commedia dell'Arte was a form of popular theatre, performing in the comic-burlesque style, that developed in Italy in the mid-Sixteenth Century, thanks, in particular, to the efforts of Angelo Beolco, called il Ruzante (1500-1542), who had his own troupe, the first records of which date from the 1530s. After about 1550, in Lombardy and the Venetian Republic, troupes of itinerant players appeared. In the midst of the Manierist furore, this form swiftly became so popular that the best troupes were invited not only all over Italy, but to courts throughout Europe and most especially, to France and England. They took with them a repertory that Molière, Marivaux and Shakespeare were at pains to study. In Spain, the Comici and the most celebrated troupes, played before Philip II, and in France, for Caterina de' Medici, Charles IX, Henry III and IV, Louis XIII, and in 1642, after Richelieu's death, Cardinal Mazarin too wished to see them, so keen was he on the Italian theatre. Their activity, that shut down by Royal Decree following an alleged insult to Madame de Maintenon, began once more in 1717 and lasted throughout the Eighteenth Century, until its decline, Goldoni's reforms having become increasingly influential. 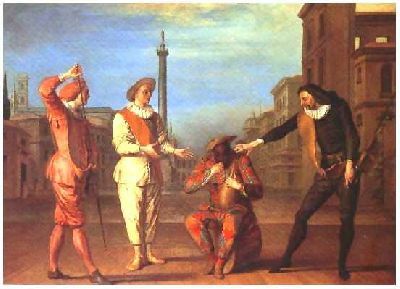 The term Commedia dell'Arte ("arte" here, should be understood in its mediaeval usage of "craft" or "skill") was coined so as to distinguish this type of theatre, where the players were professional, from that of the Court, where the players were aristocrats and scholars (Commedia Sostenuta), and that of sacred theatre, played by Church clerics. Typical of the Commedia all'italiana was the lack of any written text. The players used an outline, known as the canovaccio (canvas), bearing the synopsis and numbered scenes alone, just as was to be the case for ballet libretti. Not only the dialogue, but sarcastic sorties and jokes, all depended on extemporaneous skill. Thus, the genre was often called Teatro all'Improvviso. 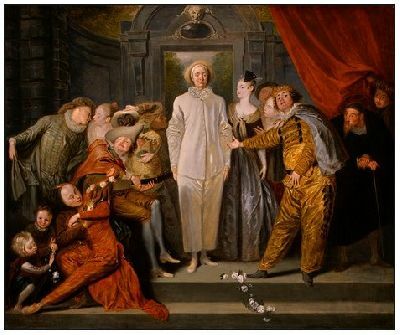 As with the Atellane, the players were themselves the playwright, they created on the basis of whatever was appropriate to the moment, drawing on a storehouse of of materials, to express standard emotions, and in accordance with a pre-defined theme: disastrous amorous intrigues, cunning tricks to make money, and all the better if a miser was fleeced thereby, trumpery wreaked on a simpleton or a fool. These were very conventional types, and the repertory itself was a popular one, that the comedies of l'Aretino much resembled (De Sanctis). Every gentleman was ridden by some parasite, eveyr gentlewoman had a confidante, and there were plentiful old hag's plots. Often, a changeling - a child who had been stolen away, or who had vanished - would suddenly reappear, while deepest night would encourage muddles and mishaps taken straight from Plautus. As time went by, the Commedia's Masks retained their original character: Arlecchino embodied the wiles of the cat, represented by one of his Masks, along with a childlike joy undented by want and misery. This wilely servant, whose heirs are Beaumarchais' Figaro, the silent-movie comics, mimes and clowns, inherits his black half-mask from the Latin satirical dramas, where characters who had lost their fortune and become servants or foreign slaves, had to blacken their faces with soot. Probably related to the Atellane's glutton, Arlecchino, like Brighella, is from the Bergamo area, although some say that the name is actually from mediaeval France. Harlequin was a devil, who turns up in the Mystery Plays of the Eleventh Century, to become Dante's devil, the Alichino. Other etymologies have also been put forward. As some of this character's features would make him a little mad, a dreamer, a melancholic, those features early on split from the Arlecchino figure, to become a Mask in its own right: Pedrolino. In France, Pedrolino became Gilles or Pierrot. A great crony of Arlecchino and Brighella, Pedrolino is an amiable ne'er-do-well, who will undertake anything for money. Both are peculiar Zanni, very significant Masks that embody the figures of those sharp-witted but poor and ignorant servants, who left their Bergamasc valleys to work in the towns. Pulcinella, hunchbacked and with a beaked nose, is the eternal bachelor and skirtchaser, and as we have seen, he descends from the Atellane's Maccus. 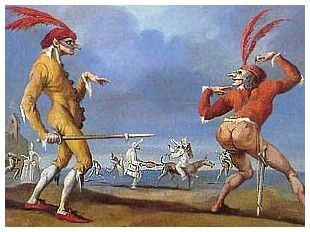 The Magnifico or Pantalone, derived essentially from Plautus' senex and in part, from the Atellane's Pappus, becomes Arpagone (Harpagon), as well as the elderly cuckold in early Nineteenth Century opera buffa. This was a caricature of the aged Venetian merchant, retired from trade, wealthy, miserly, and with a young wife or a daring daughter, who will be trumped by his wife, children or servant, but will, at the end of the day, forgive them. He has no friends other than the Bolognese Dottore or Doctor Balanzone, another pompous, suspicious old codger, who takes on a new life in Molière and Shakespeare. The Capitano, who becomes Capitan Fracassa or Capitan Spavento or Capitan Matamoros, was a caricature of the mercenary soldiers, arrogant and over-bold but withal, cowardly round the edges. The Capitan is the source for Falstaff; in turn, as we have seen, he derives from Plautus' Miles Gloriosus, and in part from the Atellane's Manducus. He wore a Neapolitan Mask, and came eventually to be replaced by the figure of Scaramuccia, dressed in black, defender of the poor. Although many Masks derive from a specific type of the Latin theatre, as is shewn by the very use of the mask, from the Manierist period onwards a throng of new stock characters appeared, whose mode of expression, vices and virtues, were no longer those of ancient peoples, but of the Venetians, the Bergamaschi, the Romans, the Bolognese of their own day. There are particular reasons, wherefore the mask "cancels out" the individual personality of he who would wear it. Throughout feudal and Renascence Europe, for a man to wear the mask, was to crave that those present bear with the mask's incognito, and the code of honour required that a gentleman accede to that request. As Sorel has noted, the Capulets knew full well that the three Masks were Romeo, Mercutio and Benvolio, but etiquette demanded that the host tolerate their attending the feast, as the Mask was an express request that they not be officially recognised. There are also anthropological reasons for the use of a mask to "cancel out" one's individual eprsonality. Ancient peoples believed that to communicate with unknown powers, one must needs divest oneself of all human appearance, and as it was thought that the spirit dwelt in one's face, an artificial countenance, perhaps that of a beast, would allow another spirit to come dwell within the individual (Sorel). Not its dramaturgy, in its manner of telling a comedy or farce, that was certainly most crude, lies the significance of the Commedia dell'Arte's approach to theatre, but rather in the extraordinary vocabulary of gesture, in its rich lexicon of "tricks" and movements that allowed a vast range of emotion to be conveyed. Never did the Zanni, for example, rely upon speech, but they rather used gesture only, and sometimes even acrobacy. With that in mind, one begins to see how the Commedia dell'Arte influenced the course of the ballet. During the late Renascence, the lively and spontaneous Comici dell'Arte were well-received at court, and word of how very good they were reached far and wide in Europe, and the best troupes were invited abroad. Thus, amongst those who, in the pay of princes from all over Europe were attached to their Courts, the Italian players who travelled to France were the first and best-known, and countless documentary sources remain. Their expressive theatre was greatly to influence the ballet de cour, Molière's reforms of French comedy, and through Molière, the ballet d'action, thus lending the dance a fresh range of expression and choreographic means. Accordingly, there arrived at Paris in the late Sixteenth Century the capocomico Zan Ganassa (circa 1540-1584), whose real name was Alberto Naselli, a celebrated Zanni who had played before the Este ducal house at Ferrara for a marriage feast. There, the French King Charles IX so admired him, that he desired that Ganassa take his troupe to Paris, and perform at the festivities marking the monarch's entry into the French capital. Zan Ganassa (the nickname Ganassa means "great mawl") so delighted the King that he remained at court for almost a year. Although enjoying the King's favour, when Zan Ganassa's troupe began to give public performances these were suddenly forbidden by Act of Parliament. The players had been so confident in their Royal Protector, that they had neglected to reply to demands put by the Confraternité de la Passion (that performed religious dramas), which guild enjoyed the privilege of overseeing all of Paris' theatrical performances, including box office receipts. Others desired that the Commedianti disappear, in order to better fend off the manoeuvres of Caterina de' Medici. 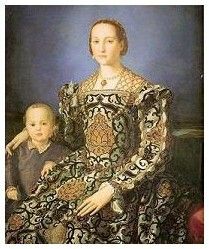 Many believed that Caterina had hired the Comici dell'Arte to distract her son Charles IX, whilst she plotted against the Protestants. Whatever the truth, Caterina most certainly attempted to strike a balance between the Catholic and Huguenot parties, and may have wished to give a signal to the Catholics, in order to counterbalance her son's predilection for the Huguenots. As it happened, tension came to a head in the gruesome Massacre of Saint Bartholomew's Night, and Ganassa's troupe having played very shortly before, at the marriage celebrated between Caterina de' Medici's daughter Marguerite de Valois (Queen Margot) and the Huguenot prince Henry of Navarre. An oil on wood panel by Frans (or Paul) Purbus probably attests to the presence of Ganassa's troupe at the ballet de cour (Duchartre) there. Turning his back on French politics, in 1574 Ganassa left for Spain, in that country's first encounter with the Commedia dell'Arte. Although by this time, Ganassa had doubtless learnt to get along with the local Confraternities, he nonetheless ran up against problems with the authorities. Nevertheless, Ganassa's troupe performed at Madrid, Valladolid, Seville and Toledo, and even before Philip II. The présence of the Gelosi is attested at Paris in 1571, notably at the palace of Louis de Gonzague, Duke of Nevers, where they played before Charles IV, Duke of Lorraine, and then at the Royal Court, before Charles IX and Caterina de' Medici. Having run against the usual opposition from the Confraternité de la Passion, they returned to Italy, and thus avoided becoming embroiled in religious civil war. In an Este villa on the Po, they took part in the first performance of Tasso's Aminta, watched by Philip II of Spain, and played both at Milan, at the festivities for the naval victory of Lepanto, and at Venice. At Venice, the Gelosi aroused the enthusiasm of Henri III, Caterina de' Medici's youngest son, then wending his way back from Poland to Paris, where he was to be crowned King of France, as his brother Charles IX (1550-1574) had just died. Henri III did not forget the Gelosi though, and invited them to Blois and Paris, an invitation they wisely took up only in 1577, once the religious wars tearing France apart had temporarily died down. On the Gelosi's return to Italy, they enjoyed great success at Genoa, Ferrara, at Venice during the Carnival, at Mantua, at Florence. The Gelosi took part in the festivities held at Florence in 1589 for the marriage of Ferdinando de' Medici with Christine de Lorraine. Within the very Pitti Palace, a battle at sea was staged, as well as a comedy known as La Pellegrina, by Giacomo Bargagli. La Pellegrina excited a great stir, on account of its six Interludes that included drama, music, pantomime and dance, brainchild of the gentleman of the Accademia de' Bardi. Indeed, at one point, a woman led the Gelosi, one Vittoria Piissimi, who had delighted Henri III in the performances at Venice. Vittoria Piissimi was an excellent dancer as well; she soon left the Gelosi to lead the Confidenti from 1590 on, whose patron was the Duke of Mantua. In 1611, when the Confidenti were protected by Giovanni de' Medici, their capocomico was Flaminio Scala. Some sources believe that Flaminio, who specialised in the part of the Innamorato (played under the name of Flavio), had once been with the Gelosi. Of that there is no proof, but we do know that Flaminio was close to the Gelosi's capocomico Francesco Andreini, who wrote the introduction to the Scala Il Teatro delle Favole Rappresentative, a treasure-chest of subjects, enough to play a stretch of fifty days' performances. 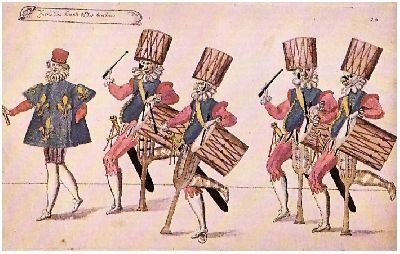 The fact that Ganassa's troupe played before the Valois-Angoulême Court, and that the Gelosi played at the Hotel de Bourgogne, greatly influenced the shift from ballet de cour towards the concept of a "ballet", as we now use the term. 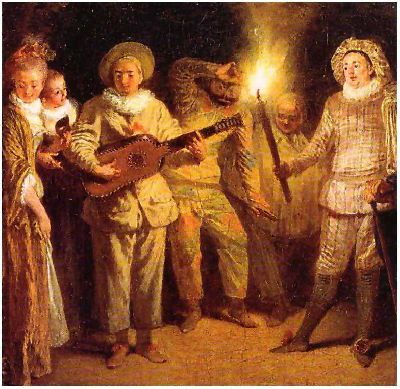 The ballet de cour, born in Italy and transplanted to the French Court under that name, was a very extravagant succession of dance and other forms, notably vocal and instrumental music, poetry recital, pantomime, and even carousels, allegorical floats and fireworks. In essence, though, what differentiated the ballet de cour from what we today call the ballet, was the lack of any over-arching concept amongst the episodes. At best, some flimsy argument would string them together, such as conjugal love, the ruler's valour, or whatever circumstances had actually given rise to the festivities. There were several currents leading up to the unified concept, and notably that of the Académie founded by Jean-Antoine de Baïf (1570), but one should not disregard the Comici dell'Arte, who at Paris, at that very moment, were putting up entertainments with a very specific dramaturgy, relying upon the language of gesture, and technical and expressive strategies proper to the Commedia. As is known, the Catholic Monarch Henri III was murdered in 1589, and was succeeded, but not without much hardship, by the Protestant Henry of Navarre. The latter, having embraced the Catholic religion in 1593 for tactical reasons, was annointed Henry IV of France in February 1594. Henry then repudiated Queen Margot to marry Maria de' Medici and invited the Comici known as the Accesi to France for the nuptials at Lyon, that were celebrated in 1600. The Accesi had been very much in favour with the ducal house of Gonzaga at Mantua, who were wont to write in person to the troupe's celebrated Arlecchino, Tristano Martinelli. Tristano is thought to have been the first to play the part of that Mask - although some say that he stole the idea from Ganassa. He tricked out the Zanni's grey costume with the variegated colours of the Mediaeval buffoons and took the name from old French fables. The Arlecchino's role was also played by his brother Drusiano Martinelli, also a member of the Accesi; their capocomico was Pier Maria Cecchini who had created the Mask of Frittellino. In France, Royal Patronage went so far as to see Henry IV and Maria godfathers to one of Tristano Martinelli's sons. When the Accesi reached Vienna in 1612 to play before the Emperor, Martinelli was ennobled. Henri IV too fell by the assassin's hand. He was succeeded by his son by Maria de' Medici, Louis XIII, under whose reign the torupe known as the Fedeli played at Paris for thirteen years straight. The Fedeli had been founded in 1601 by Giambattista Andreini, son to the Gelosi's Francesco and Isabella Andreini. Giambattista, protected by Louis Luigi XIII, has left us a number of comedies rather phantastical in plot. Some believe that John Milton may actually have taken the idea for his Paradise Lost from Giambattista's famous L'Adamo (1613). It was Maria de' Medici, as Regent until Louis XIII should come of age, who was indirectly behind the Fedeli's first appearance in the French Court: she asked her beloved Arlecchino, Tristano Martinelli, to bring together a troupe at Court. At the time, Tristano was amongst the Fedeli, and therefore the latter took up Maria's invitation. After Maria was removed from Court to Blois in 1617, Louis XIII, in turn, had Martinelli bring in the Fedeli. On Richelieu's appointment as Prime Minister, he decided to promote a national French theatre, and Italian comedy, to which he was markedly hostile, vanished from his country's stage. The Fedeli reappear in Italy, at Praga and Vienna, where they played before the Emperor Ferdinand II. 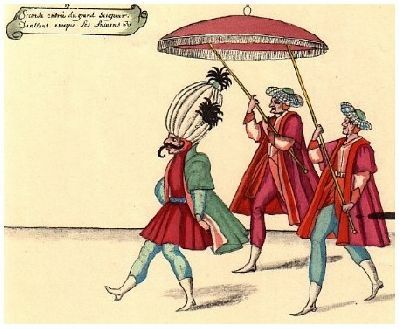 It was only in the early part of Louis XIV's reign, thanks to Cardinal Mazarin who was extremely fond of the Italian theatre, that the Commedia dell'Arte returned to Paris. 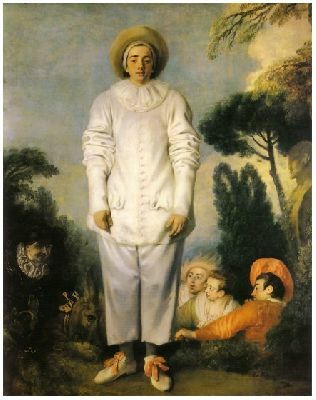 From the Commedia's activities at court, the ballet de cour, and particularly during the reign of Louis XIII, acquired a penchant towards parody and stock characters, that led to satirical works, peppered with the exotic and the grotesque, replacing the earlier mythological and heroic themes. One illustration is Le Grand Bal de la Douairière de Billebahaut (The Billebahaut Dowager's Great Ball - 1626): a Bilbao dowager celebrates her betrothal to a simpleton, as grotesque guests troupe in from all over the globe. Another example of a ballet de cour that shows the Commedia's influence is Le Ballet des Fées des Forêts de Saint-Germain (Ballet of the Saint German Forest Fairies - 1625), where each of five fairies present a burlesque episode that typifies their protégés: madmen, gamblers, ornery peasants, outlandish musicians, and dancers. 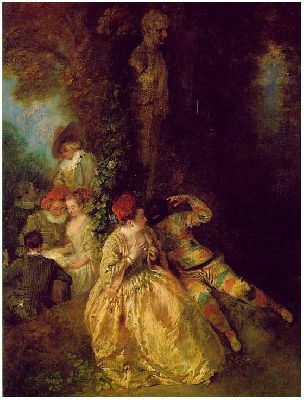 Introducing such these fresh characters into the ballet de cour meant a fresh and complex dynamic to "build them up", conveyed through pantomime and the Commedia's typical wordless forms of expression. 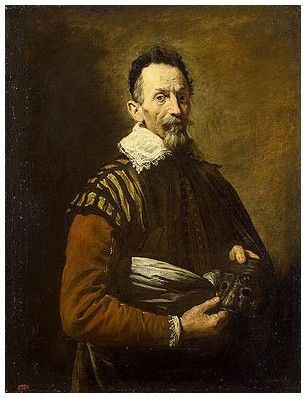 France's greatest comic actor of the 17th Century was in fact a Neapolitan by the name of Tiberio Fiorilli, who brought the Mask of Scaramuccia to Paris. A protégé of Mazarin, he was promptly introduced to Court, where he attracted Louis XIV's benevolent attention. Fiorilli appeared in ballets de cour such as the Finta pazza (The girl who feigned Madness) at the Petit Bourbon in 1645, and helped to mitigate the stiff and rigid French productions by constantly changing his personage through pantomime. Although the Commedia lived on for another century, its Paris adventures came to a short sharp halt in 1697, when at Lully's urging, Louis XIV shut down the Comédie italienne and forbade the Comici to enter Paris, following a slighting remark concerning Madame de Maintenon that one of their number had apparently uttered. Although they did tread the Paris boards again in 1717, they declined thereafter, not, however, without leaving the ballet with a further legacy, at a moment of great change in the mid 18th Century that would lead to the ballet d'action. Obeying the Enlightenment's guiding principle, "la belle nature", the ballet for the first time went beyond a purely-formal spectacle, as virtuosity was replaced by human sentiments - since what one observes in nature, is not elegant artifice, but rather movements of the soul. The great reformer Noverre thus wrote " La Poésie, la Peinture & la Danse (...) ne doivent être qu'une copie (...) de la belle nature ". The Renascence had looked to the ancient World to move away from the recent past, the Middle Ages. Similarly, thanks to new archaeological discoveries, the values of classical civilisation re-emerged in the mid-Eighteenth Century, as a guide to help the artist go beyond an earlier way of being. Where in the very recent past, the plot had been essentially led through speech and song, in the ancient classics, the Atellane, the Palliata and Togata, Lucian's dialogues, one saw the potential of the dance that, as in ancient Rome, could itself tell the story. 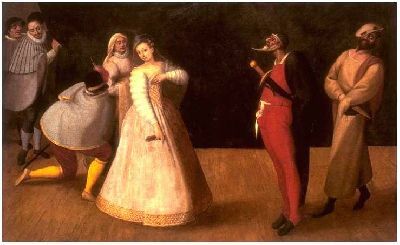 By the late-Sixteenth Century, as we have seen, Baïf's Academy had taken the concept of narrative gesture from the Roman theatre, the which, alongside the Commedia dell'Arte's example, contributed to the homogeneity of the Ballet Comique de la Royne (1581). 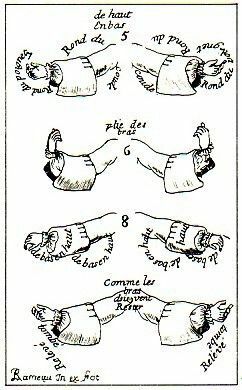 Those who sought to develop a vocabulary of narrative gesture again looked both to the ancient theatre, and to its offspring Commedia dell'Arte. 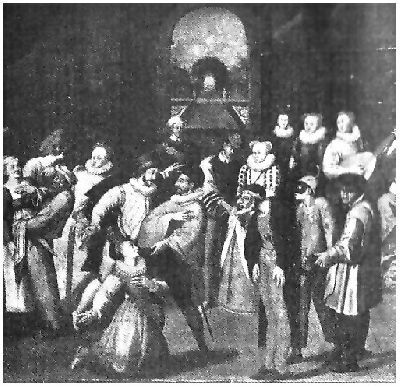 The expressive techniques developed by the Commedia, though in the style of Molière's actors, who put aside the exaggerations of their Italian model, inspired ballet masters who used the code of pantomome in a quite a new form: the ballet d'action, where the dance itself tells the story, so becoming an independent art form.